Request a quote for Rare Earth Neodymium Cup Magnets With Female Stud today. JBF National neodymium cup magnets are made using strong rare earth neodymium magnets, and are housed in a nickel finished steel cup. This cup serves a dual purpose of both protecting the magnet from damage while maximizing the magnet’s overall grip strength. 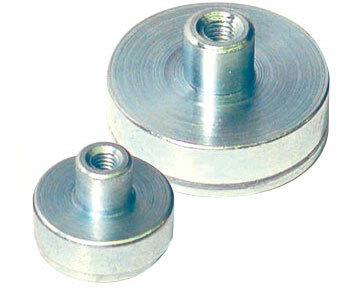 This magnet features a threaded female stud that makes mounting no problem at all.